If you’ve scheduled an initial coaching session or you are thinking of taking a coaching programme, do listen to this video in which I outline what coaching is about, how it works, and how to get the most out of your coaching programme. Most of the FTSE Chief Executives have an executive coach. So do celebrities such as Tiger Woods, Richard Branson, Nicole Kidman, Tom Cruise and Pete Sampras to name but a few. They all invest in coaching because of the difference it makes. Nowadays more and more entrepreneurs have a coach who they wouldn’t be without. I believe performance coaching is only half the story. I place as much emphasis on the lives of my clients as I do on their wide-ranging business needs. Not only are they supported to realise their potential at work, but also in their personal lives: with their relationships, health, confidence and happiness levels. 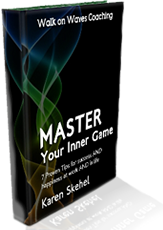 This holistic approach and focus on the Inner Games gives them what they want in order to get motivated and to stay motivated, and to achieve success across the board. Whilst I coach clients from countless industries, I have historically attracted many from marketing and creative fields, who have been drawn to working with me because I come from these backgrounds myself, and it is common place for me to uncover creative solutions to clients’ dilemmas and challenges. Over the years, I have worked with clients who are drawn to my approach. These include leaders in awarding winning recruiters, architects, retail, hospitality, the media, manufacturing, sports and leisure, AV, the professions and many other sectors that include entrepreneurs, whom seek to learn how to succeed in business. Click Our Clients to see who some of the clients I have worked with. Business leaders and entrepreneurs that excel, as well as business results that excel, is what this coaching delivers – over and over again clients achieve success in the form they have defined. Not only that, but so many of the clients I have worked with keep telling me they have never been more happy with life and happy at work.